Published May 2005 - Hardcover - 279 pages - $24. 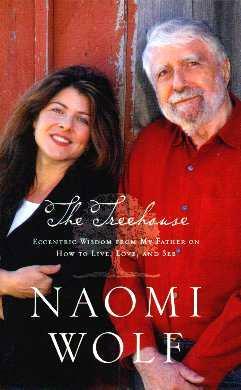 Parents are our guides in life and Naomi Wolf's book is her personal account of how her father taught her. I loved what it says about her father on the inside of the dustjacket - "...believes that every person is an artist in their own unique way, and that personal creativity is the secret of happiness". My sentiments exactly! She, like most young adults, was forming her own beliefs and opinions of the world and society, and in so doing, distanced herself from her father, the one person who'd given her the freedom to think as she liked. Years later, success and family later, something was missing. The treehouse is her metaphor for one's own place to enjoy one's private time and have time for inner reflection. Her young daughter wanted one and in her and her father's toiling, helping a friend's marriage struggles, Naomi took the time to get to know the father she'd distanced, and more importantly, learn from him. She wanted him to teach her the lessons he'd taught his students, so the book is broken up into "lessons". It's a delightful look at life - someone else's life but essentially ours - we need to listen to our own voices, give them a chance to be heard, and to also listen to others who actually have something to say. Too often people just babble and we aren't discerning enough. Naomi Wolf has an exceptional father - different, but nevertheless a loving and understanding father - a rarity. Ms. Wolf generously shares her parents' early upbringing and coming to America. Very interesting. Conclusion - A good lesson for us all and worth reading.